Get ready for an extraordinary holiday experience at the heart of Jerusalem. The Jonathan Hotel is an exclusive apartment hotel located on Ben Yehuda Street in Downtown Jerusalem. This enviable location gives you easy access to public transportation and to all of the city’s unique historical landmarks, shopping centers, restaurants, and the vibrant nightlife scene of Jerusalem. 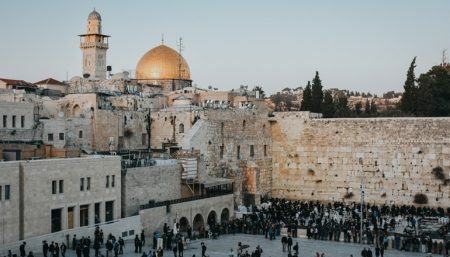 In addition, the hotel is just a few minutes walk from Machane-Yehuda Market, Great Synagogue of Jerusalem, The Knesset, Alrov Mamilla Avenue, the Old City and more. The hotel has 20 vacation rentals in various shapes and sizes. That way everyone can find the apartment that best fits their needs. Each apartment has a kitchen where you can prepare full meals, a large bathroom, and clean and cozy bedrooms where you will get all the rest you need. The hotel will make sure that you feel at home and that you get the highest quality of service. Each of the hotel’s apartments was creatively designed according to the highest standards and regulations and all apartments are spacious with homely lighting to create a more natural feel. The result: unique and high-quality holiday rentals – your home away from home. The hotel’s central location and elegant design promise a charming and relaxed vacation experience. It does not even matter whether you’re arriving as a couple, a family, or whether you need the place all to yourself. The Jonathan Hotel has an attentive staff that will be more than happy to answer any questions you may have and give you information about the best attractions and places in Jerusalem. Celebrating a special occasion? Whether it is a private party, your birthday or any other small-scale event, book a suite in advance and get help planning and hosting the party from the hotel’s experienced staff. Book your Rosh Hashanah and\or Sukkot vacation in Jerusalem at Jonathan or Jaff 60 hotels and get 30% off the third night! Book a vacation at Jonathan Hotel by phone and get 10% OFF! Dial 072-3932858 and present your promo code. The Jonathan Hotel suites are designed to give you a fun and personalized experience. Perfect for: couples looking for a romantic getaway; couples with 1 child interested in a great location; group of friends looking to be close to all Jerusalem’s hot and trendy places; and businessmen who would like to combine work with travel. There are 7 Junior Suites that can accommodate up to 6 guests. All Junior Suites have air conditioning and are spacious and welcoming. The apartments are perfect for a romantic getaway, a family vacation or a group of friends who are coming to travel and have lots of fun. The Junior Suite provides everything you could possibly need for an indulging and independent experience, including a fully-equipped kitchen where you can make your own meals, a furnished bathroom and big and comfy beds to fall in love with. This apartment complex offers 6 spacious Deluxe Suites with all the necessary amenities for a luxurious vacation. The suites can accommodate up to 6 guests and are suitable for couples, families of 6, or a group of friends that are looking for a spacious spot in the City Center. The kitchen is fully-equipped so you can conveniently prepare your own meals. With the hotel’s great location, you will ensure easy access to Jerusalem’s best attractions, tourist sites, shopping centers, restaurants and more.